It’s hard for friends and family to understand how Stargardt disease affects my vision. I totally understand that. If It’s hard for me to explain what I see, it must be even harder for someone to imagine it. I hope my BlindGirlsSee Truths help people understand better and continue to spread awareness for low vision. 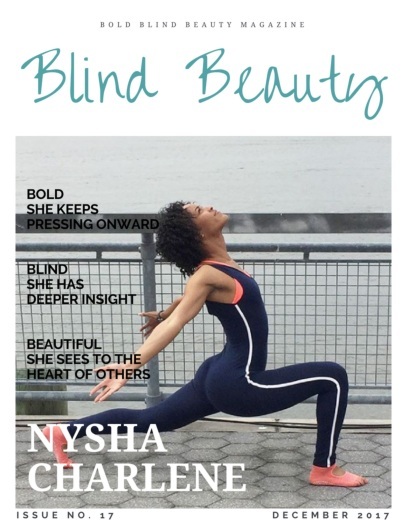 The image is a faux fashion magazine cover titled Blind Beauty. Nysha, a powerhouse yoga instructor is seen here outdoors doing one of her poses. She is wearing a navy blue long yoga leotard with a white stripe down the side and coral footies. Next post: 2017 We’re In The Homestretch! Nysha sounds like a remarkable woman. She’s so fabulous. I look at some of her poses and think to myself that I would break if I even dared tried to do them. I’m so inflexible just the thought of attempting yoga makes me want to cry. It’s one of those things I wish I would have gotten into when I was younger.